The Lakes Mirror range seamlessly enhances design ideas for your bathroom, allowing an increase in development possibilities. The Mirror range simple gives you extra space, light, practicality and the option of accommodating a popular Lakes bathroom enclosure, bringing you the best for your bathroom. All the Lakes Mirror range products come surfaced with enhanced AllClear glass advanced coating technology, the AllClear coating is inspired by nature, and formed by an invisible smooth shield to prevent the build-up of any accumulating dirt, effectively allowing your bathroom enclosure to keep clean for longer. AllClear technology is also eco-friendly, keeping your shower hygienically clean through its smooth surface, reducing the use of chemical cleaners which is kind to the environment. The Lakes Mirror range, newly developed to bring both practicality and style to your bathroom. Lakes Bathrooms have intelligently crafted full length mirror coating finishes on all of their most popular products, doors and bathscreens, generating the illusion of additional space, extra lighting and a sense of modern-day living. No need for valuable wall space for wall-mounted mirrors. All popular designs come with Mirror coating. Additional light, adding light into the smallest of bathroom spaces. Creates the illusion of space and actual space. Reduces clutter keeping your bathroom clean and tidy bathroom. Creates a sense of contemporary living. With bathrooms usually being the smaller rooms within the household, the development of the Lakes Mirror range effectively provides the illusion of extra space as well as furnishing actual space in your bathroom, providing you with a full length mirror that doesn’t require the valuable space of a spare wall, reducing clutter, keeping your bathroom clean and practical, making the most out of your bathroom space. Having light within a bathroom can allow any room to feel larger in size, with the new mirror coating finish by Lakes, light is effectively reflected across your bathroom, providing light in most areas, the mirrored surface helps to spread the source of light around the room allowing your bathroom to be brighter. Sometimes mounting a mirror, or even considering accommodating a full length mirror in your bathroom can be challenging, however, by Lakes utilising the glass design of the shower door, there is not only the uses of a surfaced mirror finish in your bathroom, but also increased privacy allowing your bathroom to be more practical for your own personal uses. All the Lakes Bathroom Mirror range designs are available without mirror finishes. All products include Lakes advance AllClear stay-clean coating finish. 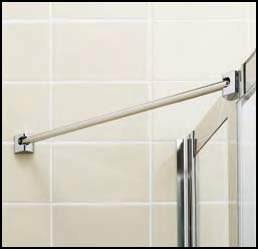 This In-Line Panel Pack is available exclusively for use with the Framed and Semi-Frameless Bi-Fold, Pivot and Slider doors.